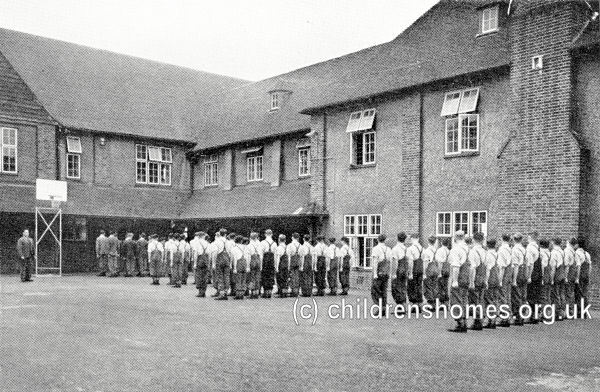 In April 1954, the Blantyre House Detention Centre was opened at Roundgreen Lane, near Goudhurst, Kent. The premises had formerly housed the Canada Training Farm run by James Fegan to prepare boys for emigration. In its new role, the establishment housed up to 99 senior boys, aged from 17 to 20, who had been sentenced to short prison sentences of up to three months. Inmates on parade at Blantyre House Detention Centre, Goudhurst. The establishment was re-opened as an adult prison in 1991 and acted as a resettlement prison for long-term prisoners. It was amalgamated with East Sutton Park prison in 2007.